BRIT is spreading the word on reintroducing native plants to urban landscapes. 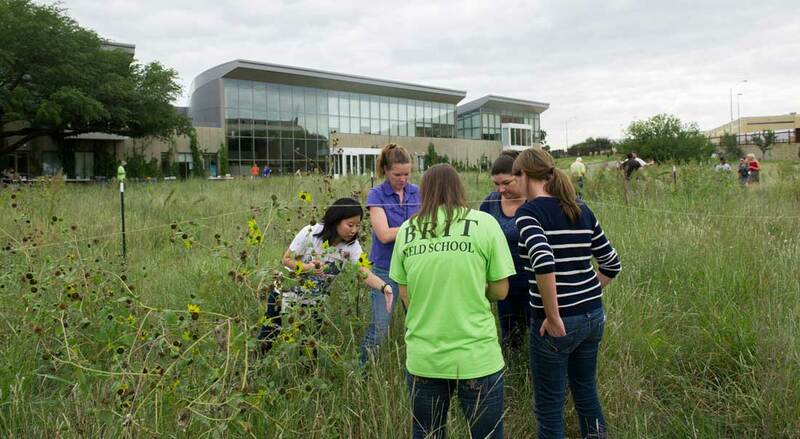 On the grounds of Fort Worth’s Botanical Research Institute of Texas is a patch of land that looks out of place next to the sleek new facility. The field of tall, wild-looking prairie grass is an experiment of Karen Hall, applied ecologist at BRIT, and it’s part of the effort to preserve two important aspects of Texas’ heritage and future — its native plants and its diminishing water supply. The experiment, called the Prairie Preservation Project, is part of an ongoing collaboration among BRIT, the Institute of Environmental Studies at Texas Christian University, Native American Seed (a Texas company specializing in native grasses and wildflowers), the Fort Worth Nature Center and Refuge, and environmental organizations. The goal is to educate the public on the benefits of planting native species and to reintroduce prairie ecosystems in this area. To get the information out, BRIT is using its educational programs, which reach thousands of residents, teachers, and students each year. The city and other groups involved are spreading the word as well. The city’s Stormwater Management Division recently began seeding native grasses instead of Bermuda grass along public water channels. The hope is that native grasses will do a better job of preventing erosion along steep banks because of their deep roots. Linda Stern, spokeswoman for Stormwater Management, said BRIT and the Nature Center are “advising [the city] on ideal soil conditions for native seed mixes and grasses.” Compared to Bermuda grass, drought-resistant native grasses require “less or even no watering and mowing,” she said — characteristics that the city hopes will save money. It’s all about water,” said Bill Neiman, founder of Native American Seed. In 1980 Neiman was running his own landscaping business in Flower Mound when a record drought made him rethink his approach to lawn care. “We were doing all the wrong things,” he said. “We were planting African Bermuda and Caribbean St. Augustine. Is it really appropriate to put tropical plants, which are used to rainfall of up to 160 inches per year, in the heartland of Texas?” Nationally, almost a third of residential water usage goes for watering lawns, according to the Environmental Protection Agency. Unlike corn and many other crops, prairie grasses have roots that reach 20 feet or more into the soil, Neiman said, allowing rainwater to percolate deep into the ground and refill aquifers. “Why is it that the world’s largest aquifer, the Ogallala, lies right under the heart of the world’s largest prairie?” he said, referring to the vast reservoir that stretches beneath the Great Plains, including large areas of Texas. Much of this part of North Texas was originally covered by a plant community known as Fort Worth Prairie. It’s characterized by a high percentage of limestone in the soil, a grass called Little Bluestem, and a unique mix of tall and short grasses. “Early settlers of Fort Worth described these prairies as breathtakingly beautiful,” said Michelle Villafranca, director at the Nature Center. 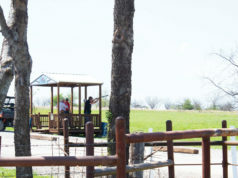 Located in northwest Fort Worth, the center is working to restore 80 acres of its property from gravel pits to prairie. The process involves digging up soil from 20 feet below the site and redistributing it at the surface, on top of soil brought in by the city that would otherwise end up in a landfill. “The area had been fenced off because it was unsafe due to past gravel mining by the city, and now we are returning it to its native landscape mosaic,” said center director Rob Denkhaus. Prairie preservation may be a cause whose time has come. Don Young has been working for years to preserve Tandy Hills Natural Area, a 160-acre indigenous prairie in the heart of Fort Worth, one of the last patches in the city. Farther south, Jarid Manos and the Fort Worth-based Great Plains Restoration Council have tried for seven years to find a way to preserve the 2,000 state-owned acres of tallgrass prairie at Rock Creek Ranch. 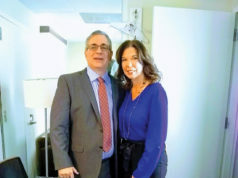 Although Manos and his supporters staved off development for a while, and even though the TCU institute is still studying plants there, the state’s General Land Office is selling the land to developers. In trying to convince owners of public and private property to reintroduce prairie plants, part of the challenge is getting them to embrace the wild look of natural grasses. “Texans have some basic assumptions about how they want their yards to look,” said Will McClatchey, director at BRIT. Motorists on University Drive probably wonder at the recently planted prairie patch that’s at the heart of the BRIT project. At the northeast corner of the facility, the 150-by-60-foot plot is sectioned into three long rows representing native prairie soil (recovered in Crowley); soil as the BRIT workers found it onsite, representing inner-city conditions; and a mixture of the two. Using grasses from Native American Seed, BRIT scientists at are searching for the ideal soil conditions to restore prairies. Now three months old, the plot is a tall patchwork of Little Bluestem, buffalo grass, and other indigenous plants. If the use of native plants instead of typical lawn grasses were to become widespread, the benefits could go far beyond water conservation. “Restoring any ecosystem reconnects the food webs of animals,” thus increasing wildlife populations, Hall said. With the loss of Rock Creek Ranch, the prairie preservation cause seems to be taking one step forward and one back. Just last week, thousands of monarch butterflies stopped to feed on the ranch’s milkweed on their southerly migration to Mexico. The visit was a not-so-subtle reminder of the prairie’s ecological importance. Michael Slattery, director at TCU’s Institute for Environmental Studies, said the loss of Rock Creek Ranch will have detrimental effects for scientists. Slattery oversees a team of TCU graduate students who are studying native prairies near there. “We cannot neglect our own backyard,” he said. “The urban environment is becoming very generic,” she said. Neiman believes that the first step will be for people to lose their “monoculture mentality” in which every green space needs to look like a “putt-putt field.” Through his work at Native American Seed, he is working to persuade people to re-think landscaping and to see their yards as outdoor living spaces. Justin Fischer, a University of North Texas student and former intern at the Nature Center, is already on board. At his mother’s home in north Fort Worth and his father’s house between Denton and Fort Worth, Fischer has replanted the yards with native species — Little Bluestem, Indian grass, Mexican hat wildflowers, and milkweed. Fischer can’t wait to own his own land. “I want to be able to return any piece of land I can back to its natural habitat,” he said. 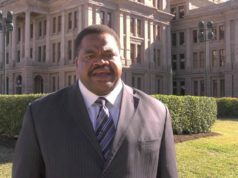 Fort Worth freelance writer Edward Brown can be reached at ejb0017@yahoo.com.